Synopsis: They took his money. They took his family. And now, they've taken his hands. But they can never take his revenge! Exploding from the same hallucinogenic netherworld as TURKISH STAR WARS, THE SWORD AND THE CLAW stars Turkish genre legend Cuneyt Arkin in his most iconic role. It's CONAN THE BARBARIAN meets The Three Stooges meets DOLEMITE with more lo-fi bloodshed, pop-art visuals, and bizarro dubbing than the boundaries of reality can handle. This slice of Turkish strangeness from the 70's is a cornucopia of medieval violence, action and WTF-ery, opening with King Solomon in a over-the-top battle scene that is just wonderful with arrows and swords, blood and laughs, it has a little bit of everything here for lovers of action, mayhem and weirdness. After winning the battle Solomon forces the surrender of his enemies, Commander Antoine and his new bride Princess Maria, but Antoine plots with Bishop Osorio to overthrow Solomon is one of the most amazing red-carpet roll out of all time - this has to be seen to be believed, a knife-throwing assassin is hidden away in the rolled-up carpet while an archer is packed away inside a trunk! In the aftermath Solomon is stabbed repeatedly and his hands are cut off while bracing a door which allows for his beloved (and apparently very pregnant) Princess Almunia to escape with the help of her loyal protector Rhastim. In perhaps the quickest birth of all time she pops out a boy while on the run, but she dies soon after. Rhastim hides the baby in some nearby bushes while he contends with Antoine's guards who are in pursuit. However, when he returns to retrieve the baby it has been taken by a pride of lion's who seemingly adopt it as their own! Years later the crooked Antoine rules his kingdom with an iron-fist, while Rhastim is involved with a group of rebels who continue to plot to overthrow the tyrannical Antoine. This awful-fun Greek-Turkish co-production might be bad but it is certainly entertaining, a colorful bit of foreign genre movie making that makes very little sense, but there's just something so fun about it. We get a phenomenally bad English-dub, loads of sword play and plenty of non-stop action, plus garish period costuming. Continuing the story, the boy-heir grows up to be known as the Lion Man, a feral man who fights for good in the nearby villages, sort of like a sword and sandal Tarzan by way of Robin Hood, protecting the villagers from the tyranny of Antoine, before joining up with Rhastim and his men to launch an all out assault against the the evil King. The choreography is fun, there's lots of ropy swordplay and people being launched off of springboards, with Lion Man often times pouncing on his prey. 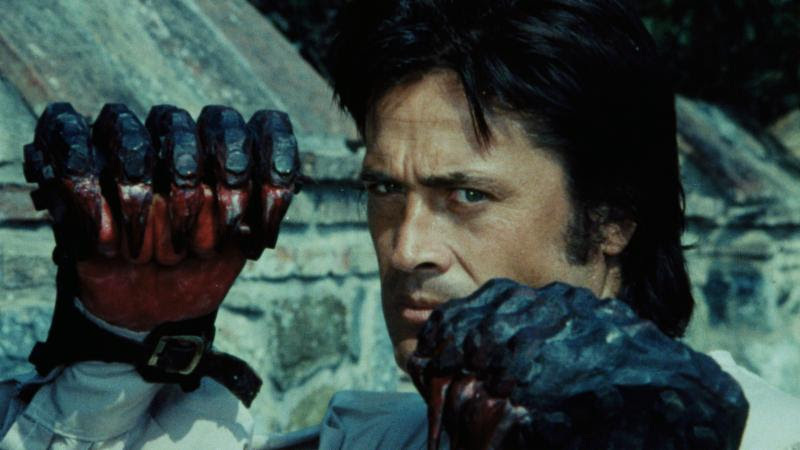 Later in the film when his hands are destroyed by acid he's outfitted with a metal-crafted pair of gloves with large claws, so we get to some fun carnage with some blood during the last ten minutes. 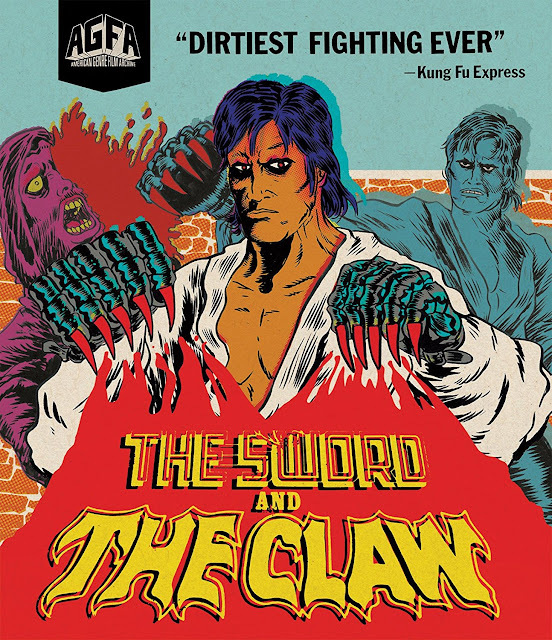 The Sword and the Claw (1975) is not a good film but I will say that it's fun and weird, the bad English dub is a hoot and there's no shortage of carnage and action onscreen. 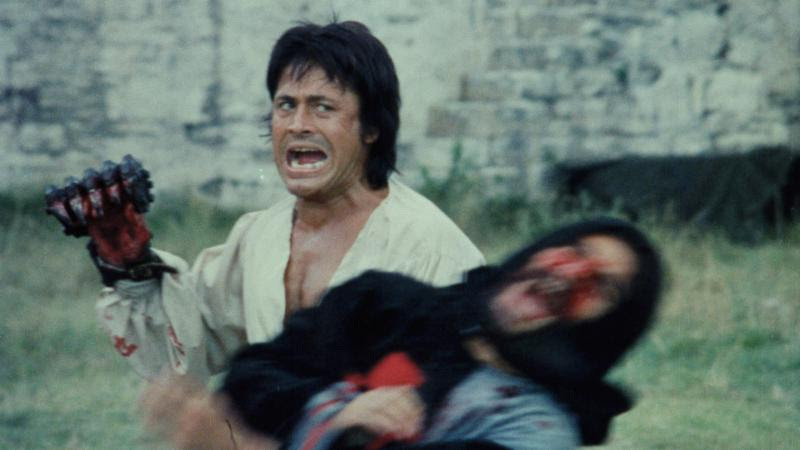 Audio/Video: The Sword and the Claw (1975) arrives on Blu-ray from AGFA with a new 4K transfer from the only 35mm theatrical print in existence, and it looks raw as Hell. The first few minutes was so lousy with white speckling I thought it was snowing during the opening battle, but after that it cleans up considerably, there's still plenty of scratches, grit and damaged frames but the colors are quite nice with a fair amount of detail. Audio comes by way of a English-dubbed DTS-HD MA Mono 2.0 track, it's a bad, boxy dub that has all the charisma of a first grader reading an instruction manual, like trump without the hand gestures, but that's just part of the fun. 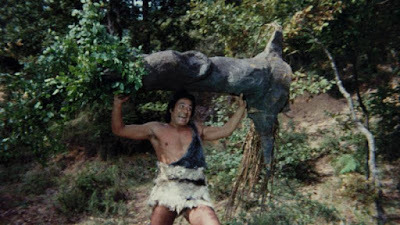 Extras on the disc include 10-minutes of face-smashing action trailers from the AGFA vaults, this includes Argoman and the Fantastic Superman (1967), Superargo and the Faceless Giants (1968), The Three Supermen in the Jungle(1970), The Three Supermen in The West (1973), and The Supergirl of Kungfu (1975), plus as usual we get a bonus feature, this time it's the South Korean gravity-defying kung fu flick Brawl Busters (1978) starring Black Jack Chan - whoever that is! This is sourced from a 2K scan of a theatrical print and is also well-worn with plenty of print damage and emulsion scratches. I have never been a huge kung fu/martial arts fan but this was a lot of fun, we have a squad of female warriors, some fun fight scenes and lots of wuxia-style shenanigans, and hilarious dubbed dialogue. I really just watched this oe in the background while I did some chores round the house, peering in occasionally to enjoy the action, which there was plenty of, but I didn't follow the story much at all. This single-disc Blu-ray release comes housed in the usual clear Blu-ray keepcase with a sleeve of reversible artwork, featuring some sweet artwork from Alexis Ziritt. Notably this is the only AGFA release not to feature a booklet and essay - I guess there are just some releases where nothing more can be said about the movie other than presenting it, ha ha. - New 4K transfer from the only 35mm theatrical print in existence! - Bonus Movie: BRAWL BUSTERS (1981)(83 min), a new 2K scan from an original theatrical print! - Reversible cover art with illustration by Alexis Ziritt (SPACE RIDERS)! I do believe you have to be a special kind of movie-watcher to love this sort of wacky foreign cinema, and I am that special sort of person! Looking at what AGFA have released so far I am certain none of these movies would have ever landed on my screen if not for their diligent work in unearthing/preserving wacky z-grade cinema, and this was an action/laugh packed double-feature, I think it's one of their strongest pairings. While I enjoyed watching it on my own I can only imagine the fun-factor exponentially increases with the number of friends/beers you watch it with, so grab some brews and jump into the fire. Here's hoping that AGFA keep these z-grade oddities flowing full force for the cinema-weirdos, cheers!